I’ve been busy opening a new food production and services company called SavannaBel – Bush Gourmet here in Livingstone, and my first customer happens to be The Elephant Café. 🙂 In celebration of this milestone, I am reposting a short piece I wrote a couple of years ago on how the seasonal garden produce and wild food inspire my recipe development. There will be much more of this sort of thing in the months ahead, which I look forward to sharing with you! Yotam Ottolenghi‘s recipes, rooted in his Middle Eastern upbringing, have made me much bolder in the kitchen. As an originator of such unexpected yet sublime combinations of flavor, color and texture, I see him as the mythical shapeshifter of all that I harvest from my garden (and deep freeze, for that matter). When I head outside to pick my way through an entanglement of edibles to inspire a dish, it’s Ottolenghi I invariably channel … in mind, tastebuds, and spirit. For a recent Sunday lunch it was no different: I needed to pull together some salads to complement a lamb tagine made with apricots and preserved lemon, which I was serving with an edible flower couscous. It was Ottolenghi territory, and the following is what I found in the garden to work with: Lima beans, watercress, haricots verts, yellow cherry tomatoes, green and yellow courgettes, chillies, lemons, spring onions, and lots of fresh herbs. In addition I had stored red onions, bags of pomegranate seeds in the freezer, and a batch of muchingachinga syrup I’d just made. Bring a large pot of water to the boil. Add the haricot verts and blanche for five minutes. Remove with a slotted spoon into a bath of cold water. Blanche the Lima beans in the same boiling water for about two minutes. Drain and run under cold water for a minute or two. Discard the skins by pressing each Lima bean between your finger and thumb. Place all the beans and the watercress into a large mixing bowl. Add the remaining ingredients, finally seasoning with salt and pepper to taste. Stir gently, and serve as quickly as you can. Bean, Watercress & Mixed Seed Salad. Preheat the oven to 170/325 degrees. Bring a small saucepan of water to the boil, add the lemon slices and blanche for 2 minutes. Drain well and transfer to a mixing bowl. Pour 1 tablespoon of the olive oil, as well as the salt, the sugar and the sage over the lemons, and gently mix together. Spread everything out evenly onto a parchment paper-line baking tray, place in the oven and roast until the lemons have dried out a little. Remove and set aside to cool. Heat a cast iron skillet over a high flame, or fire, and chargrill the courgettes until just cooked (they should still have a little crunch to them). Remove and set aside to cool. Whisk the muchingachinga syrup together with the remaining olive oil and the allspice. 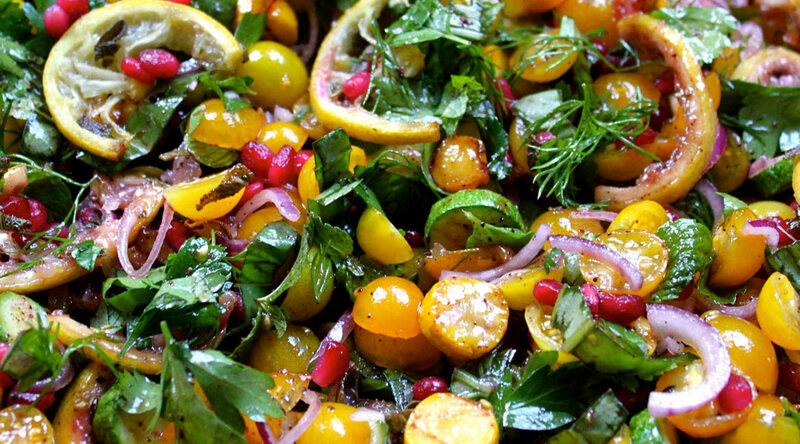 Mix the tomatoes and courgettes in a bowl with the herbs, red onion, and pomegranate seeds. Gently stir in the lemon slices and muchingachinga dressing, and season to taste with salt and pepper. Transfer to a serving dish, and garnish with remaining pomegranate seeds. Tomato, Chargrilled Courgette & Roasted Lemon Salad with Muchingachinga Dressing. It all looks delicious – so fresh. Thank you, Georgie. Fresh is best! Your blogs are a feast for the eyes, can only imagine the real taste! Much gratitude, Jan … how nice it is that most things grow here! Oh my, once again awesome and inspiring gardening and recipes. I can’t wait to make the roasted lemons. Hey Annabel, not showing off, (okay maybe a bit) but a couple of years ago my sister Susie treated me to a meal at Ottolenghi’s in London. What a moment! We left the ordering up to the waiter, who turned out to be from Fourways in Johannesburg! He just knew what we would enjoy. I think Ottoleghi would be so thrilled at your food and will probably have to pull up his socks! Joking Yotam. I want to travel to Zambia now, just to eat your food! !